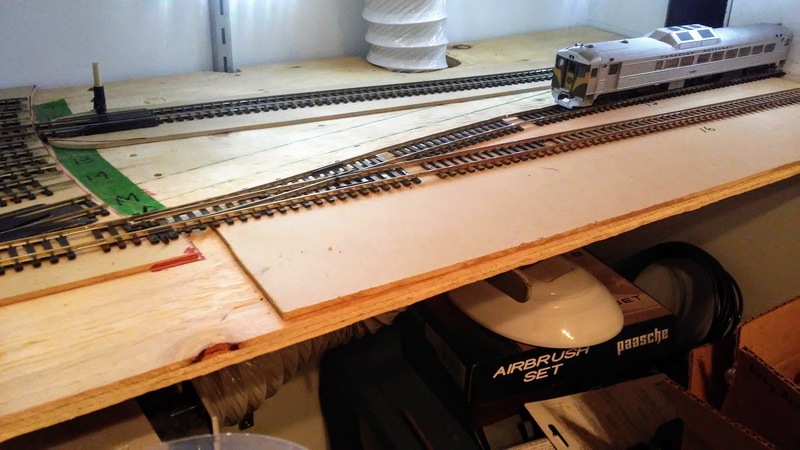 I am doing some work on my layout changing points and wanted to be able to move some of my tools around with me more easily. 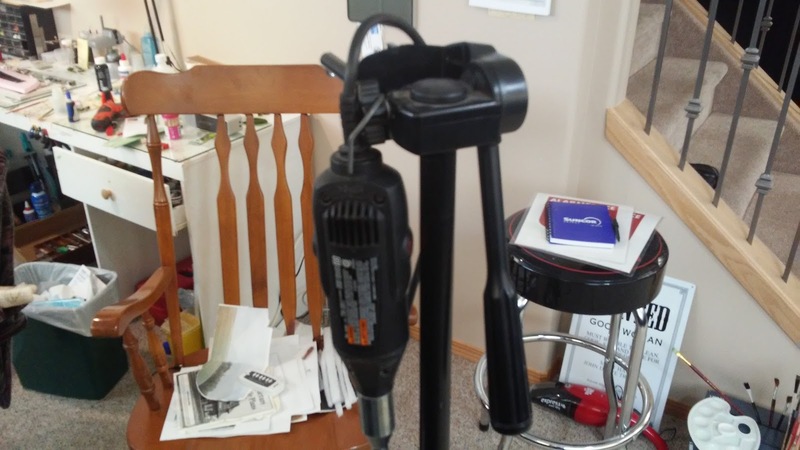 I was looking for some way to hold my Dremel tool with a flex shaft. The flex shaft can't be curved too much or it will bind. For my soldering iron I wanted to be able to put it somewhere when it is hot so it would not melt or burn anything. 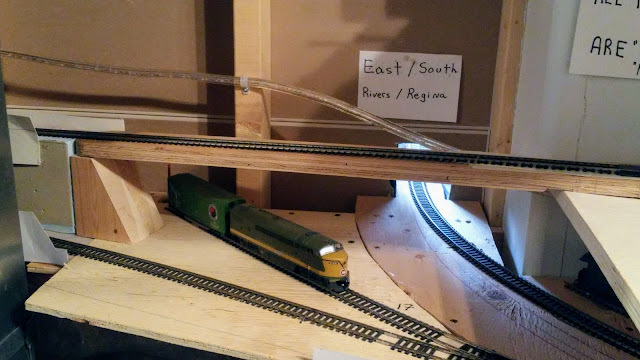 I was going to be do some work on my layout with scenery already in place and needed to move it around easily. 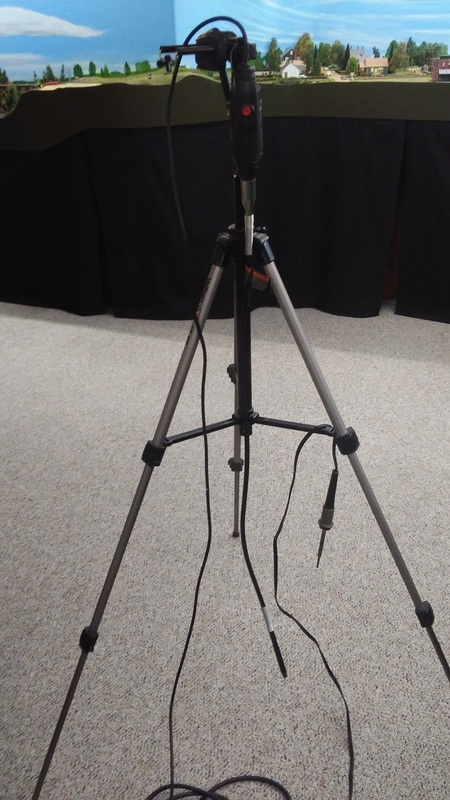 I had thought of buying a mike stand, then my wife suggested that I use my tripod for my camera. I also needed to be able to move around the tools that I would be using and have them close at hand. I now just use a chair with wheels on it. I just draped the soldering iron over the leg brace. It is still 1' off the floor. I am just showing the cell phone holder that is mounted to my tripod. It is a part off of a $10 selfie stick. All my model and scenery pictures are taken using a tripod. This is my portable tool bench. It is just an office chair from the crew lounge. It has rollers so I can just roll it along as I move from place to place. Sometimes I put a towel down if things are dirty. 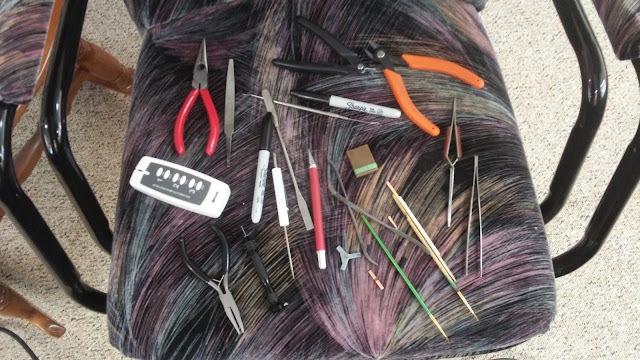 I spend a lot less time looking for tools. I am in the process of changing out the throw bars and points on my turnouts. That white remote is for turning on the power on my layout. 1 turns the power on to my DCC, 2 & 3 turns the power on to my 12V buses. The receivers are all plugged in to a common power bar and then each device plugs in to a receiver. This equipment is all under my layout. Not very expensive. Van Hobbies CNR U-1-f Mountain. This model came from the last run and has a coaster drive, factory paint, raised numbers on running boards, back head detail. I installed a Soundtraxx 750 Medium steam decoder in this locomotive in 2014. This was a difficult install only because of the factory paint. 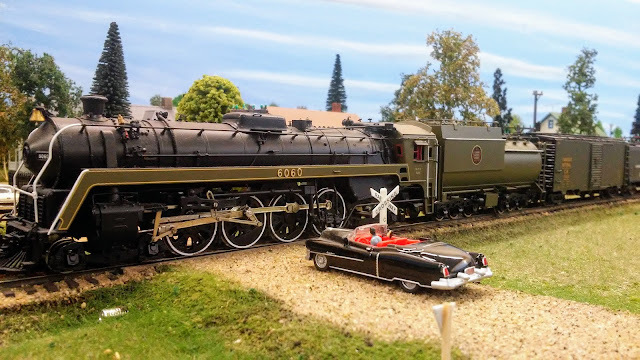 I gave a lot of thought to this and had to consult Wayne in Ontario on how to get the ash panels, and smoke box cover off without scratching the paint. The ash panels fit very tight and have to be removed to get the shell off. It takes a leap of faith to pry them off without doing any damage to the paint or the brass parts. 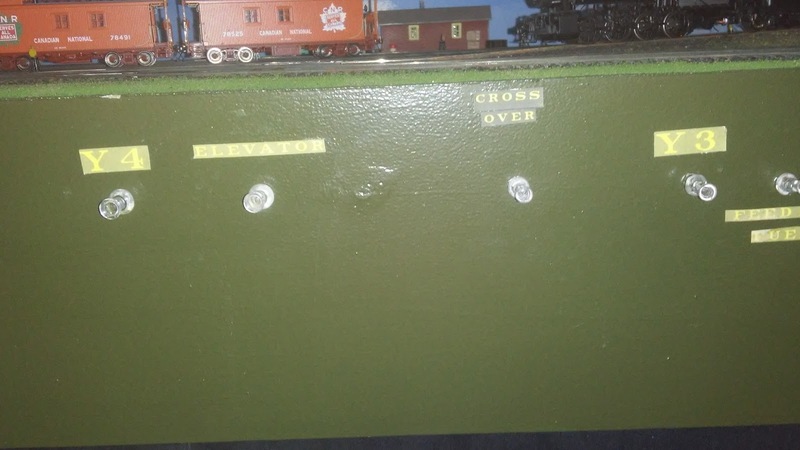 I managed to remove the front of the smoke box and could install the decoder in that space. While I had this open I installed an LED light. 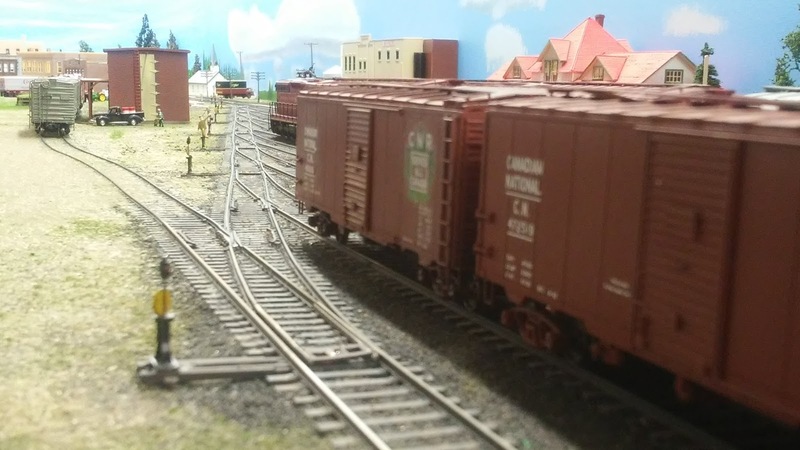 I ran the wires back to the motor and pickups from the tender and the loco. Next I had to find a place for the speaker. I could not place it in the tender, mostly because it is an oil Vanderbuilt and only had a 1/4" slot in the bottom of the tender to get a speaker inside and then there would be no way for the sound to get out. It would have been very difficult to remove the plate from the bottom of the tender without doing damage to the paint. I chose to install a mini oval speaker in the floor of the cab which works well as it turned out because you can't really see it. This loco runs really nice but did have some problems with the front and rear trucks that like to short on curves. A lot of time was spent on trying to fix the problems. In the end the spring for the trailing truck took off when I was taking it apart and in the moment I didn't feel like making a new one. I put the truck back on and turned the screw in so that the truck was not tight and gave it a try. Well guess what it worked just fine and it is the best it has ever run. I took the screw back off and put a little white glue on it to hold it in place. By having the spring removed it also changed the balance and it pulls much better now. The front truck ended up with a lighter spring as it was lifting the front drivers off the track, with the lighter spring the shorting went away. This is all part of running brass steam and you have to stay diligent until you get the problems fixed. It will still take some maintenance to keep it from shorting by adding lacquer nail polish as the paint wears off and bare brass gets exposed. Here are some shots of it pulling train #62 Yorkton to Regina just leaving Melville. It is entering the end of it's career and is on less important runs now. It is pulling a box baggage, reefer, and a coach. I knew once I looked at the price of Tortoise machines x 40 turnouts that it was going to be too much cost and opted for this method which I had used on one of my other layouts with a few changes. The DPDT slide will hold the points in place. I started with a double pole double throw slide switch. I had originally intended to have one set of contacts wired to a red/green LED in the fascia. 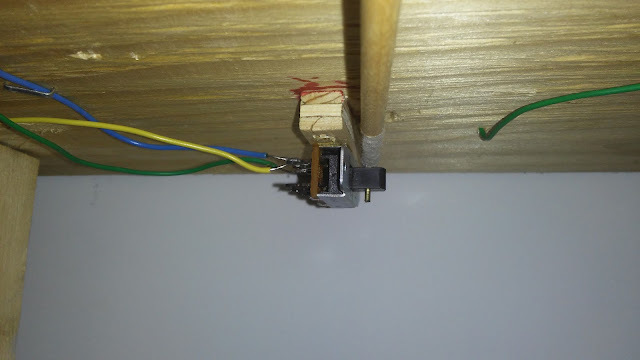 Once I had finished doing all the soldering for the feeder wires under the layout, I had had enough of being under there so it has not happened yet. The pictures below aid in the description. 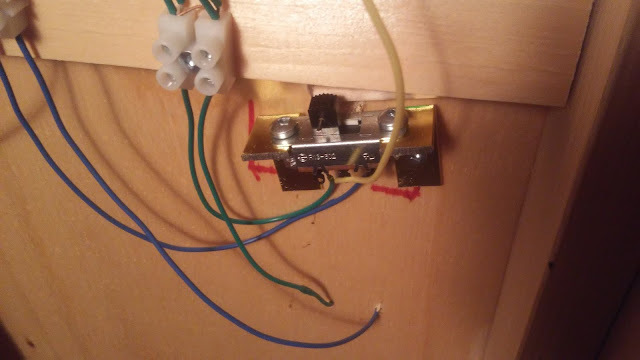 I epoxied the switch to a small block of wood that I ripped from some 3/8 plywood. They ended up 1/2" wide and 2" long. It has to be long enough to leave room for adding the 2 screws that attach it to the plywood under the turnout. NOTE I did have the epoxy let go on a few as they are not straight in from the fascia and there was more torque on them so I made 2 angle brackets from some cheap flat decorative aluminum bar stock and bent them to 90 degrees, drilled 2 holes and screwed them to the mounting holes of the switch and then attached them to the underside of the layout. Next I drilled the slider on the switch and installed a short piece of brass tube OD .06 with an ID of .056. It is 1.5" in length which is long enough to be lower than the throw bar. 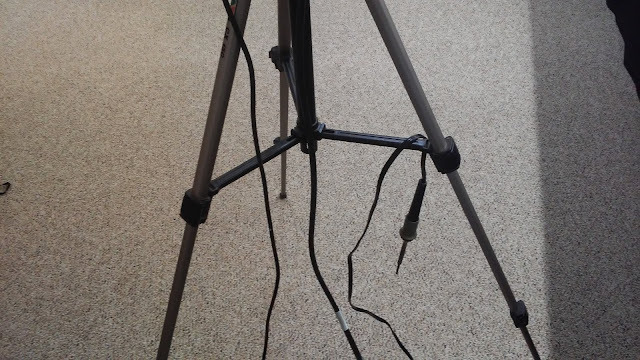 The tube gives extra support to the piano wire and provides a means to connect the drilled dowelling. The piano .055 wire goes up through to the throw bar on the points. I did it this way to make the connection as stiff as possible and still be able to maintain the small size of the wire. This also gives more rigidity for the ⅛ inch dowel to work against. I drilled a hole 1/4" in from the end of a length of dowel so it would side over the brass tube. I drilled a corresponding hole in the fascia straight out from the switch that is one size bigger than the dowel. The dowel is inserted from the fascia side, I pulled the brass tube down and mounted the dowel. I then marked the dowel just 1/16 " longer than the fascia, removed it and cut it to length. I then drilled a hole in the end for the push pin to go into as a tight fit. The dowel is then put back in, attached and then the push pin is glued in with CA. It is rare to have a push pin come off the end of the dowel. If it does I just re-glue it and it is ready to operate in seconds. The face of the push pins stops the dowel from going past the fascia. The wire inside the brass tube can be adjusted up and down and once fitted it is held in place with a bit of white glue. The slider on the switch has just enough throw to work the points from one side to the other but must be centered properly. The brackets are screwed in with #4 screws. I made the hole in the bracket for the switch just a bit larger so that there was room for some lateral adjustment. Once everything is in place I put a drop of CA on the wire to hold it to the throw bar. I made labels in Open Office using CN fonts which you can get from the CN Lines web site printing them in CN #11 yellow with a CN #11 green background with settings that I got from the net. The labels are then cut out and glued to the CN green #11 fascia with a kids glue stick. Removal is easy using a wet cloth, once they are damp they just wipe off. Use a little soap on the cloth to remove the glue residue. Shows an installed unit.The yellow wire goes to the frog and the other 2 are from the track bus. I just used the top row of pins. The bottom row of pins would be used for lighting the LED. This shows the wood block that I used to start with. The only problem here is that the epoxy let go on a few that had too much torque on them and I switched those out to the metal angle bracket below. This picture shows the rods coming through the fascia with the push pins attached to the end of the rod and the lettering that is used. Code 55 to the ice house and code 70 on the ladder. The switch stands add a lot to the scene. Points on this turnout have not been changed out yet. A little background. 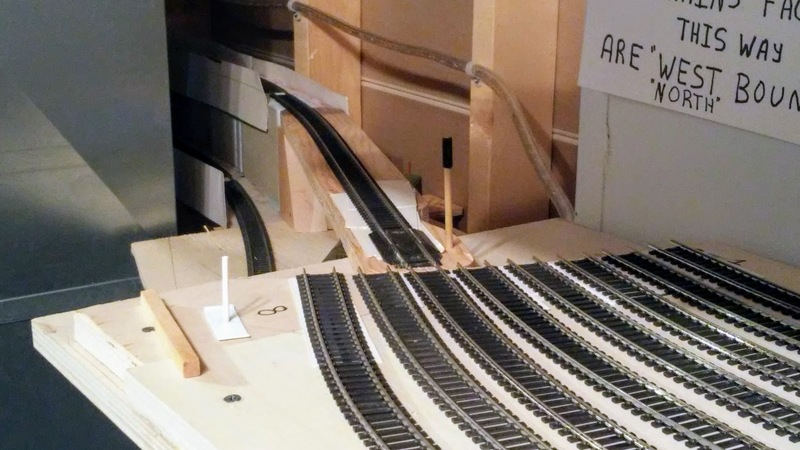 When I started this layout I looked at prefabricated turnouts and I just could not come to terms with the price for some 40 turnouts, although it would be easy. I didn't have the courage to hand lay everything because of time and my ability/experience. I like trying new things though and don't mind having to do some work/modeling. 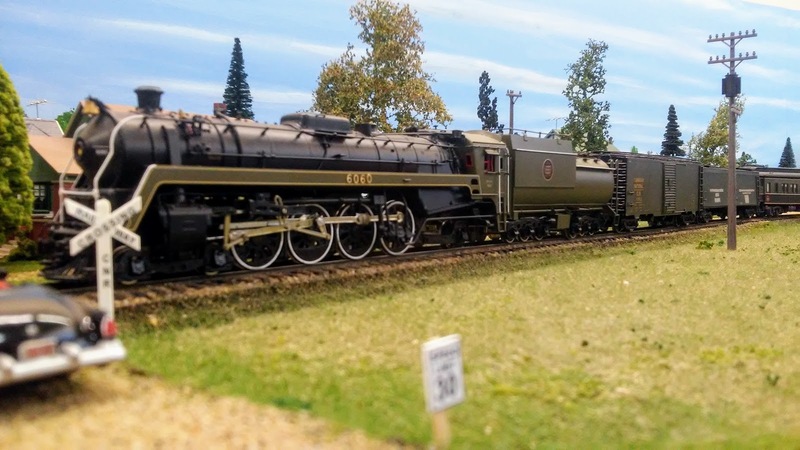 I then came across the Central Valley system and liked the price point, difficulty was midway between hand laid and prefabricated which didn't seem too difficult and the ability to have a consistent look with different rail codes. I knew I would be photographing this layout and felt it would look good with the different codes and it does. All my track work outside of staging is from Central Valley. 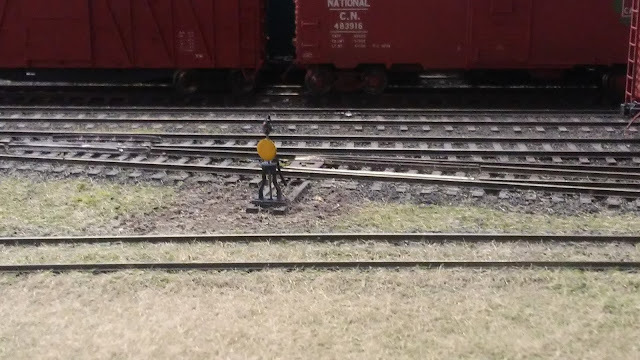 The main is code 83, the yard is code 70 and the sidings/spurs and engine terminal is code 55. Most the rail is weathered Micro Engineering some had to be weathered by hand. I followed the recommendations by CV. The tie strips (main and branch ) and turnouts were glued down to the painted foam with Weldbond white glue. The ties are then painted and weathered some. At this point the rails get their feeder wires soldered to them.Then I mixed Barge contact cement with lacquer thinner, this is painted on the bottom of the Micro Engineering rail. Holes are drilled through the layout top for the feeder wires. The rail is then laid in place on the tie strips and is finally glued down by using a touch of lacquer thinner. I also install some ME spikes by drilling a tight fit hole in the tie and putting a little CA on the spike. On a recommendation I did not use rail joiners at all since the rail has to be pre curved to fit the radius of the corner and thus there is no forces applied to the rail except for Charlie’s VH CP 2-10-2 brass Selkirk with no blind drivers that went around the 36" radius curve and peeled off the outside rail as slick as anything. The rails for the turnouts are cut as per instruction and wired and glued down the same as the procedure above. The frogs came from Proto 87 and each one is wired so they are live and the polarity changes when the switch is thrown. 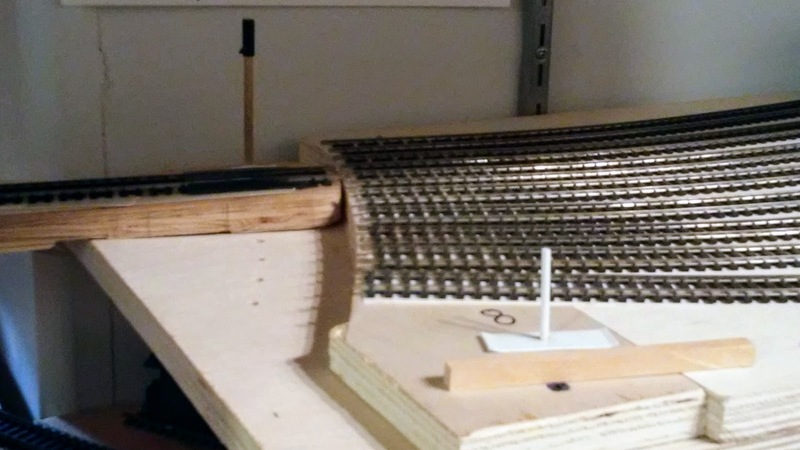 Then the final touches of weathering are applied to the rails and ties and it is ready for ballast. Once the ballast is in place I then go back and weather some more. I mixed dirt and water and paint the dirty water on, add some brake dust where needed and some spills and rust. 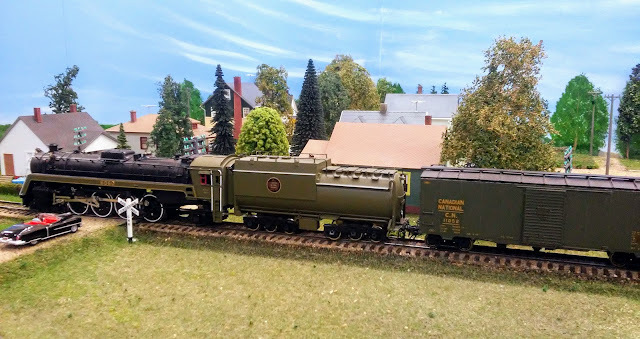 There are 31 turnouts in the yard and the price for each turnout at the time was C $13 plus my time equals about half the price of Walthers switches. All of these instructions can be found on the Central Valley site. The point throws are all manual as they were in 1959 and will be covered on their own in a different post. When I laid the rail I joined them too close at .01-.02" and as it grew ??? would pop off the rail. These spots have since been gapped larger, the rail does come loose once in a while if it gets caught by a steamer. And I just put it back in place and give it a touch of lacquer thinner and it is glued back down. 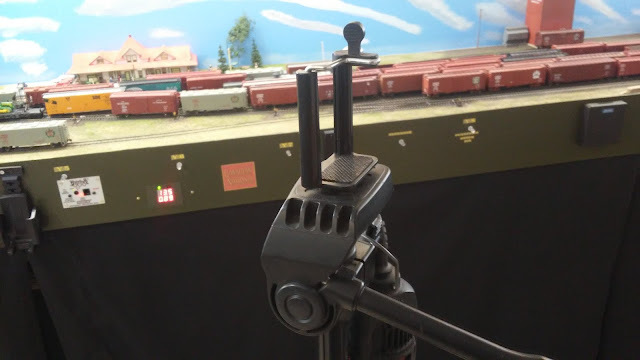 The switch stands come with the turnout tie strips or can be purchased separate as part of the detail sprue and look good enough although not CN. They can be made to rotate the target when the turnout is thrown but I gave up on these as they are hard to make work properly. Now if one gets knocked off by an 0-5-0 or something they are easy to glue back in place with no harm done. I ordered caboose markers from True Line trains and cut the mounting pin off and drilled a hole in the bottom and mounted them above the target. The targets are from a hand drawing I got from one of the guys on CN Lines list. I cut them out of styrene, painted them and glued them to the stand. Now... 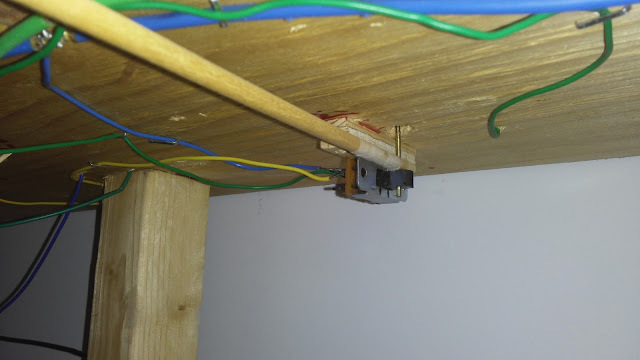 I am in the process of changing the switch points out as the ones that come with the switches do not work very well and have caused problems. 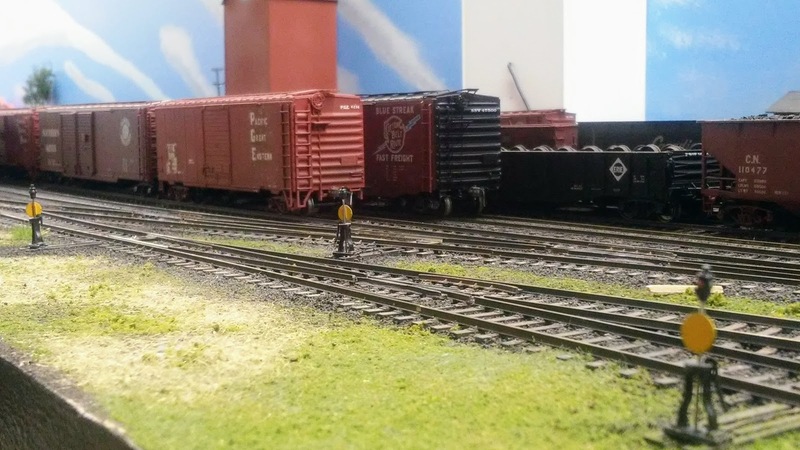 If I was to do it again I would follow Joe Fugates poor mans switch article in MRH and all would be good, when using his article you would get better points and frogs.This article came out after all my switches were installed. Go figure. 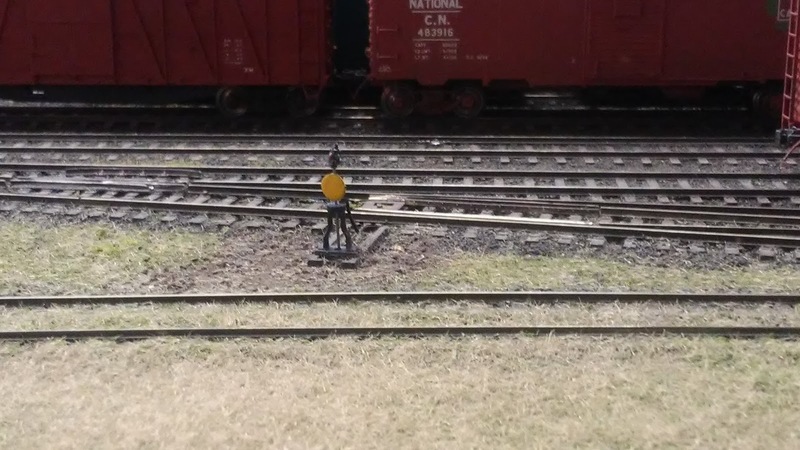 As a side note I have built a couple of switches using Fast Tracks and when I put the Fast Tracks over top my Central valley it is an exact match as far as gauge goes. My friend Peter had given me this link MRH sector plates. We had been talking about how I was going to make the limited space in staging work when I didn't really have room for a ladder. Here are some pictures of the sector plates that I use in my staging area. This is the sector plate for the bottom level of my staging. It serves 6 tracks plus the main. The hole in the wall goes out to the layout. This one works really well as it is flat. The only critical part is drilling the hole for the pin to go in to to hold the track in place. The hose in the background is the vent for my paint booth. The next 3 pictures are of the sector plate on the 2nd level. Same basic design but was much harder because of the 2% grade involved. This one seems to be more prone to changes in temperature and humidity which might be because it goes around the furnace. The little white stick in the foreground with the skid plate on the bottom of it. This is used to assist in lining up the tracks. The little wood post is a support for the end of the shelf. The wood block was needed to make the transition from the Woodland Scenics risers and a pivot point. That little block took a lot of thought. That 1/2" tube mounted on the wall is a string of LED lights that runs under the bottom of the 2nd shelf and lights up the bottom shelf and the back side of the loop. It is about 5 years old now and is sort of old tech already, as you can now get flat ones that are only 1/4" thick. They work great and save a lot of space. That said the one on the top shelf is a bit fussier to correctly line up because of the grade to that shelf. 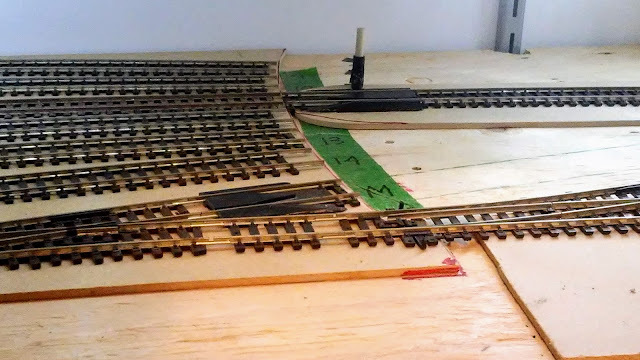 I use the little white tool to line line up the rails and then lock the track in place with the little stick. If you are going to use the little stick to hold the track make sure you give enough room for the cars to get by and not touch it. I am not completely convinced that using the Atlas re-railer is necessary. The one thing I did find was that once it was cut the rails came out of guage and had to be shimmed back into guage. As you can see it is only used on the bottom shelf when the track is lined up to the main line, the other 6 tracks work fine without it. The one on the bottom shelf has been installed for 6 years now and has needed no maintenance. It is tough to get quality pictures due to the fact that there is incandescent and LED lighting used in this area. Again the lighting between the levels is an LED rope that I bought 5 years ago. It works well but the newer ones are thinner and brighter and you have choice over what colour of white you would like. If you have any questions contact me by email.